Basically these grow like a taller version of a carpet, with a low habit that is horizontal. Sometimes the flower stems may be more upright. Many spreaders are evergreen or semi-evergreen. Where the stems touch the ground, they may sometimes root themselves or sometimes not, depending on the plant. If they do root, you can remove small sections to start a new patch somewhere else. Like carpeters, spreaders often have a cascading style when grown on a wall or at the edge of a container. The low but bushy habit makes these suitable for using as specimens or grouping in medium to large-sized patches. These will grow well in small cracks and crevices between the rocks in a rock garden or wall, but generally they are too tall to use in between flagstones on a path without causing a trip hazard. 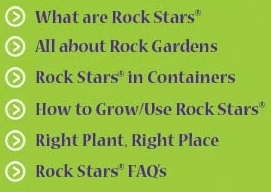 To see different Rock Stars® with a spreading habit, try using our Advanced Search to locate them quickly and easily.